Canine cognitive dysfunction is a disease that is caused by brain changes in aging dogs. It’s similar to Alzheimer’s. A recent study identified three stages in canine cognitive dysfunction. Stage 1, MILD: Changes in sleep patterns and slight changes in social interactions with owners. Stage 2, MODERATE: Hyperactivity at night, starting to lose house training, and starting to require special care. Stage 3, SEVERE: Dramatic behavior problems including aimless wandering, barking through much of the night, lack of responsiveness to their family, and significant house soiling. If your dog has canine cognitive dysfunction, these stages can help you understand the progression of the disease. The research may be able to indicate how much time your dog has. • Spatial orientation. This included such behaviors as disorientation, aimless wandering, and failing to recognize everyday objects. • Social interactions. This included changed behavior towards family members, less exploration and other interaction, irritability, and aggression. There was also reduced response to commands or cues. • Sleep-wake cycles. This included both insomnia and the opposite, hypersomnia, where the dog slept an abnormal amount. It also included abnormal behaviors during the night such as wandering and barking. • House soiling. This included not only elimination in inappropriate locations but also the loss of the normal ways to signal elimination. The researchers recorded the frequency and of the symptoms in the different categories. They also noted when each symptom appeared. This information allowed them to divide the progress of CCD into three stages. Dogs in the mild stage had generally not been identified by their owners as having any problems. This finding implies that most dogs with mild CCD do not get diagnosed at that stage. The main problems in the mild stage were slightly changed social interactions with their owners and changes in sleep patterns (e.g. sleeping more in the daytime). Dogs in the moderate stage tended to show obvious loss of house training and often were hyperactive during the night. Their owners definitely noticed behavior changes, and the dogs needed more care. Dogs in the severe stage had problems in all four of the categories. Their owners reported behavior problems that were difficult to deal with. These included things like aimless wandering, barking through much of the night, lack of responsiveness to their family members, and house soiling. The study also found that progress from mild to moderate cognitive dysfunction was rapid. About a quarter of the dogs who had initially been diagnosed with mild cognitive dysfunction had progressed to moderate dysfunction in six months. This portion rose to half the dogs at the one-year mark. This is roughly five times faster than the progression of human Alzheimer’s. The scientists remarked that that might be related to the fact that dogs’ lifespans are about one-fifth of ours. The message for dog owners is that the symptoms of cognitive dysfunction typically worsen, and often pretty quickly. My own Cricket’s first symptom was a change in social interaction with one of her best human friends. At the time, we couldn’t figure out why Cricket suddenly acted afraid of her. We thought she had just gotten generally more anxious. Just as in the study, Cricket had a symptom, but I didn’t recognize it as such (and didn’t know about canine cognitive dysfunction). She was probably in the mild stage of dementia at that time. 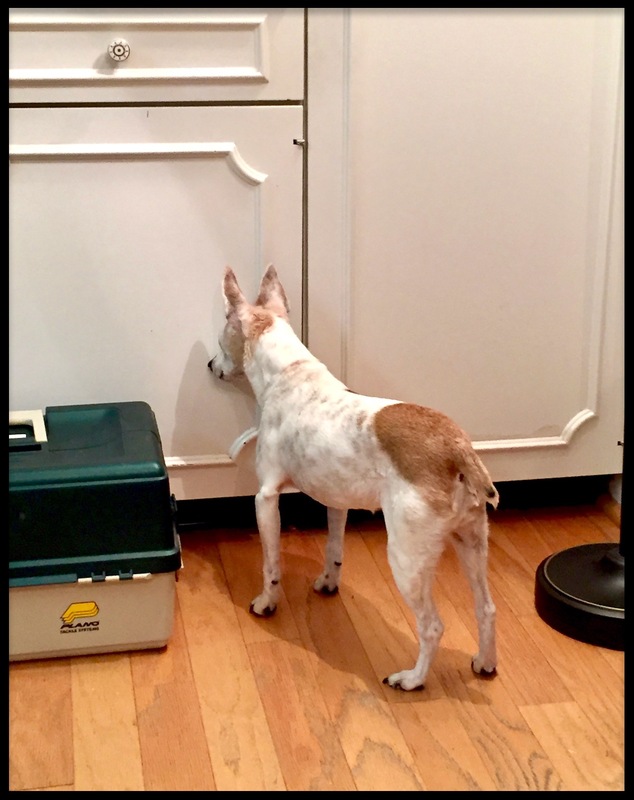 In about a year, Cricket started wandering, standing in odd places, and losing her house training. This corresponds with the moderate stage. We were lucky that she never had bad sleep disturbances. In her final year, Cricket had most of the problems listed in the study and was clearly in the severe stage. She wandered and circled, and forgot where she was going. She defecated freely. She had trouble remembering how to eat. She slept in odd places (see top photo). But she had lost the anxiety, probably through the help of the medication she was on, and did not seem stressed. She still had a good quality of life even when her capacities were diminished. What Stage of Canine Cognitive Dysfunction Does Your Dog Have? Identifying the stage of a dog’s dementia can yield an idea of the possible progression of the disease. But remember, every symptom that could be canine cognitive dysfunction could also be something else. So, if your dog has not been diagnosed but you think she might have the disease, you need to speak to your vet. You can’t diagnose your own dog. But here is a printable symptom checklist. You can print it, fill it out, and take to your veterinarian if you are worried that your dog may have dementia. If she does, or if she just needs more care because of age, my book has lots of tips for helping her. My 13 yr old Golden, Mattie, has Dementia and is spending more and more time stressed. My vet has her on Trazadone and Melatonin at night and CBD oil and now has added Xanax. She eats and chasing her food ball around but will all of a sudden stop and get panicky looking around and trying to hide. She pants heavily at least an hour each night usually from 5-6 probably when her meds are starting to wear off. Any suggestion?No accidents in the house yet but seeing her stressed is tough. I have no idea if it is time. but I do know that the only time she seems ok is when he meds have kicked in. Is it cruel to keep her medicated all the time? She is totally healthy otherwise- all labs, etc were great. I just don’t want to be selfish but on the other hand I don’t want to so this too early. I’m sorry Mattie has dementia. It’s especially upsetting to see our dogs frightened and stressed from this disease. I really love hearing that she still plays, though. This is just my opinion; I’m not a vet or a doctor. But I see nothing wrong with keeping a dog comfortable with meds. I have a dog who is on twice daily psychiatric medication. It’s for a panic disorder, not dementia. But from what I see, it helps her be comfortable and be herself. Have you spoken to your vet about your concerns? My vet helped me a lot about this. Give Mattie a treat for me. She’s so lucky to have you!